When you setup your Google Custom Domain, you enjoy the personal satisfaction of having your own non BlogSpot URL. You publish your blog to a non-Blog*Spot URL on a Google server, and your BlogSpot addresses still works. This setup lets people and processes like search engine spiders continue to find your blog in BlogSpot, while you enjoy your non BlogSpot URL. You define your domain, and how the content is hosted, using a series of "A" and "CNAME" referrals, pointing to Google. Before you can do that, your registrar has to define how the domain is hosted, using a series of "NS", SOA, and related records. The latter task lets your registrar maintain your domain, and hundreds of others - with each domain sharing their servers, reliably. Sometimes, even righteous DNS addresses don't result in an accessible blog, when published to the domain. If the domain is improperly setup, we can't diagnose the problems. This domain needs to be returned to the registrar, for their action. 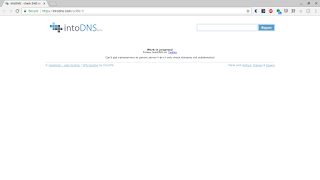 The online service IntoDNS is used to diagnose domain setup problems - but some problems even they can't identify. The registrar has to fix this problem. Here's what I might see, in a Dig log for my domain "nitecruzr.net". nitecruzr.net. 604800 IN MX 10 aspmx.l.google.com. nitecruzr.net. 604800 IN MX 20 alt1.aspmx.l.google.com. nitecruzr.net. 604800 IN MX 30 alt2.aspmx.l.google.com. nitecruzr.net. 604800 IN MX 40 aspmx2.googlemail.com. nitecruzr.net. 604800 IN MX 50 aspmx4.googlemail.com. nitecruzr.net. 604800 IN MX 50 aspmx5.googlemail.com. nitecruzr.net. 604800 IN MX 50 aspmx3.googlemail.com. Before I could define the Google servers "216.239.32.21", "216.239.34.21", "216.239.36.21", and "216.239.38.21" as hosting the domain content, my registrar had to define the domain itself to the Internet. Essential domain entries are the "SOA" and the 2 "NS" records. If my registrar had not setup my domain properly, I might have seen other results. Here, we see that "myfictiousdomain.com" doesn't exist, excepting in my mind. In this case, we get the "SOA" record for the ".com" TLD. Here we see that "myfictiousdomain.com" was registered by eNom ("name-services.com" is an eNom domain), but no DNS addresses have been setup. or a similar error. Please, know your responsibilities, and your registrar's responsibilities.